With the huge diversity of gorgeous gemstones available, finding the right one for your engagement ring can be challenging. One way to make your decision is to consider the durability, hardness, and longevity of the stone. The Mohs hardness scale measures the hardness of stones, giving each stone a number between 1 and 10. The harder the stone, the higher the hardness rating. Simply put, the harder the stone, the less likely it will be at risk of chipping and everyday wear and tear. As beautiful as a stone may look, it is always worth considering its hardness ratio in order to decide whether you want to take a chance that your ring may require repairs, polishing or even replacement at some point down the line. To give you a better idea of how stones compare, we have put together a list of the best and worst gems for your engagement ring. Diamonds. With a hardness ratio of 10, diamonds are the strongest, hardest, toughest stones on earth. Your diamond will very likely last you for the rest of your life with little to no chance of chipping and damage unless it is physically damaged. This is where the saying, “diamonds are forever” comes from... because diamonds truly do last forever. Rubies. Closely following diamonds, rubies have a hardness ratio of 9, which is almost as strong as diamonds. This means that your ruby will have a very good chance of looking just as stunning as it does no in 10, 20 or even 50 years down the line. Sapphires. Sapphires also have a hardness rating of 9, making them just as hard and durable as rubies. There are a surprising number of colours to be found with this stone, from the classic deep blue all the way to deeper and lighter shades of blue. Pearl. Pearls have a hardness ratio that is between 2.5 and 4.5, making them the weakest of all gemstones. If you do choose to include a pearl in your ring, make sure that you always remove your ring when washing dishes, bathing, gardening, playing sports, going to the gym, doing any home DIY or cleaning, or any other activity that may put your ring at risk. 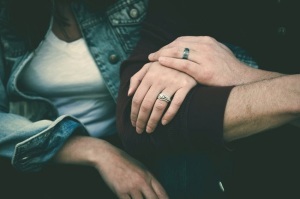 If you store your ring carefully and wear it on special occasions, it will last. Opal. Known for their endlessly varied colours and designs, opals have become popular once again in recent years. These fascinating stones have a hardness ratio between 5.5 and 6.5. Although a bit harder than pearls, they will still require special care and storage. Be extra careful not to wear your ring when you are doing any activity that could cause damage. Emerald. Although they are resistant to scratches, emeralds contain a number of tiny inclusions and cavities within the gemstone that make them susceptible to cracking and chipping. Needless to say, this is the last thing you want in a ring you plan to wear for the rest of your life. As classic as they are, these stones have a hardness ratio between 8 and 7.5, making them not the hardest stones to use for this type of ring. If you would like expert advice on how to choose a gemstone for your custom engagement ring, be sure to contact Cape Diamonds today. Infinity engagement rings are loaded with symbolism. Representing the eternal bond between married partners, along with endless love and happiness, these rings feature a crossover design that loops for eternity. 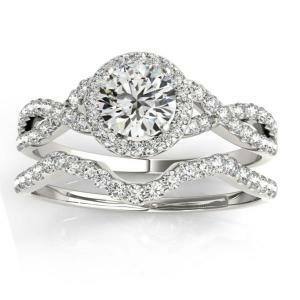 There are a number of stunning styles offered with this type of ring. To help you find some inspiration for your ring, we have put together a list of our favourite eternity style engagement rings. If you prefer minimal rings, this style is sure to catch your eye. 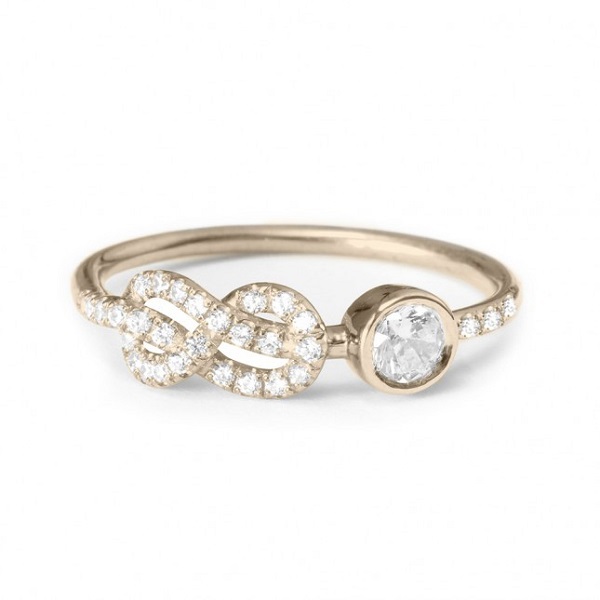 Featuring a delicate knotted band, encrusted with tiny pave stones, and a simple centre stone, the soft gold tone of this ring further adds to its charm. 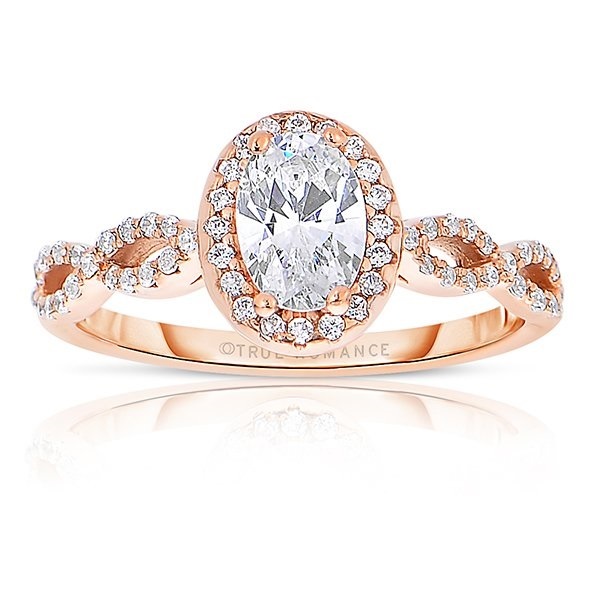 This ring would work well with any metal and stone, but diamonds and soft gold give it a classic, feminine look that works well with its delicate band and small, deep-set stone. Pear cut rings are surprisingly versatile. 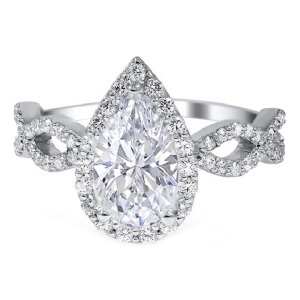 A favourite over the ages, this style features a pear shaped stone. A gently twisting infinity band dotted with pave stones flows towards the halo pear, ensuring plenty of sparkle. Pear shape rings can be worn with the point facing up and down, depending on your preferences and whether you want to make your finger look longer or shorter. This gorgeous engagement set features a classic pave style eternity ring, along with a fitted wedding ring that slots into the bottom or top of the ring. Worn alone, this ring is impressive enough, but when worn with the wedding ring, this stacked ring set becomes even more magical. 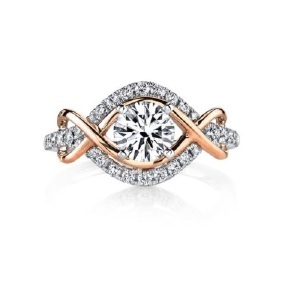 An elegant round halo ring with a gently twisting infinity band in rose gold ensures lots of sparkle. 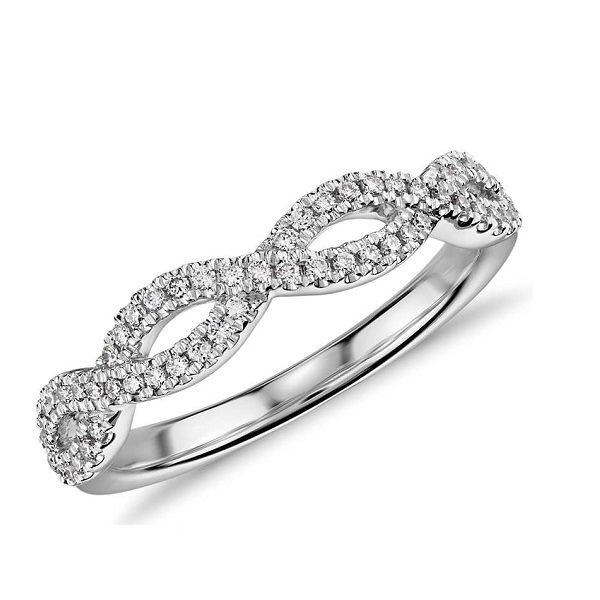 The gentle oval shape of the centre stone will suit every hand, while the classic eternity band features infinity signs on both sides, adding to its romance. This ring would work well with any metal and stone. Two tone rings are ideal for those who like to stand out for all the right reasons. 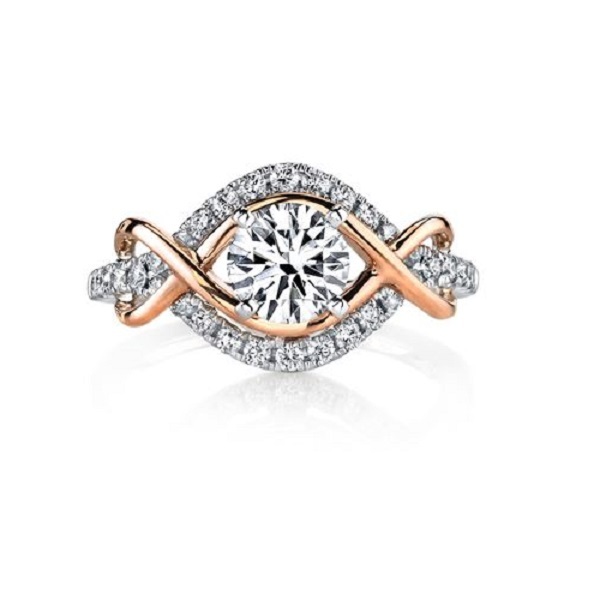 This ring has a subtle touch of rose gold that is threaded through the sophisticated pave infinity loops. The result is a balanced ring that has maximum shine and a centre stone that is beautifully framed. You could choose yellow and rose gold or yellow and white gold or platinum for this ring as well. This simple ring has a delicately twisting infinity pattern on its band, dotted with tiny pave stones. If you are not wild about large solitaires and centre stones, this ring is sure to be a good choice. You can add visual interest by threading two metals instead of one, or adding coloured diamonds, rubies, sapphires, emeralds or a colourful stone of your choice. 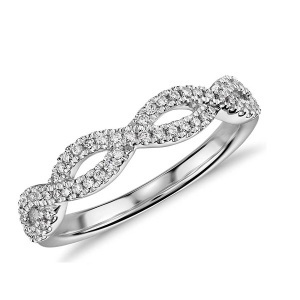 This modern ring has a simple solid metal band, and a single infinity loop in pave stones. 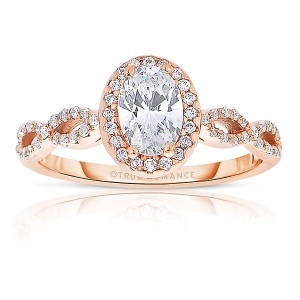 Brides-to-be who favour a more contemporary look will love the simplicity of this ring. Despite its simple design, the pave stones will add plenty of impact without being over the top. You could also try adding a second metal to add more interest. This style would work in any metal. 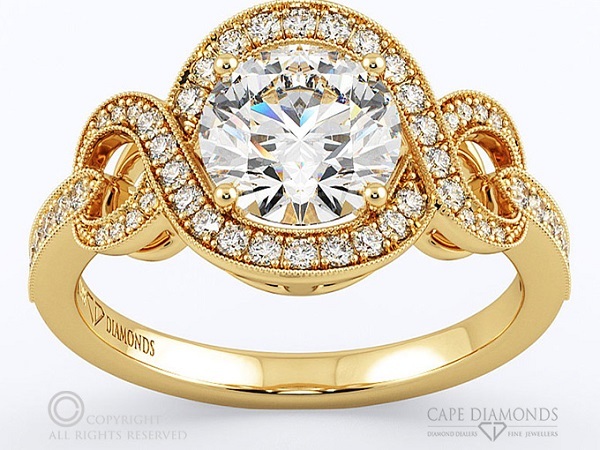 For those who are searching for a big, bold and super romantic ring, the halo crossover ring in yellow gold from Cape Diamonds is a breathtaking choice. This eye-catching ring features two infinity loops, one on each side, which twist gently over a halo centre stone. 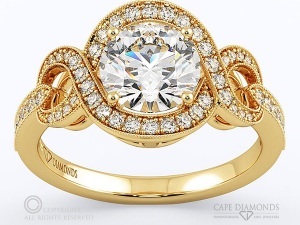 In yellow gold, the effect is especially beautiful, but this style would also work in rose gold, white gold or platinum. 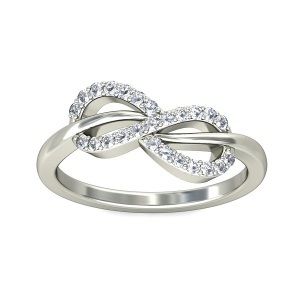 Looking for a beautifully designed custom infinity ring for your upcoming vows? Contact Cape Diamonds today to find your dream engagement ring in Cape Town.